Why Study In China On Scholarship for Pakistani Students 2018-2019? China is on the list of most amazing and popular countries for the international students to study abroad because China has the long history of a modern education system that based on practical and also because of its stunning culture. China Scholarships for Pakistani Students 2018-2019 | Scholarships in China. According to international study abroad survey more then 5 lacks students came to China on scholarships for their higher education from over 180+ countries including Pakistan. China is now at the Top position in the list of Most Amazing and developed countries that focus on Practical education in the whole world, that's why international students especially Pakistani students prefer China for their Higher Education. By studying in China you will get a great chance and opportunity to explore a new culture and amazing cities of China. Mostly Pakistani students have a low budget they can't afford expensive education in study abroad, If you are one of them that can't afford expensive education like 10 Lacks per year fees then stop worrying, China is Offering hundreds of thousands of scholarships in almost every field for brilliant international students especially for Pakistani students. China has recently increased the no of scholarships for Pakistani students due to the impact of CPEC (China Pakistan Economic Corridor), and also due to the China-Pakistan long friendship. So its a very great opportunity for every Pakistani student who wants to study abroad but doesn't have enough money. FlyUp Consultants are working on China scholarships for the last 5 years, and Providing Scholarships in Bachelor's, Masters, & P.hD degree programs in almost every field. 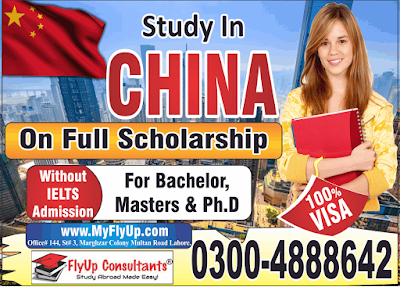 Flyup Consultants is highly reputed and the only Company in Pakistan that is offering so many scholarships in China for brilliant Pakistani students and this company is also Registered from FBR. More then 15000 Scholarship has been provided to Pakistani students through Flyup Consultants in the past 5 years. We are the Official representative of more than 300+ China universities that have signed a contract with us. If students have 60% in his Last Degree than we will provide 100% confirm scholarship on the done basis in Bachelor's, Masters & Ph.D. respectively Without any kind of entry test. If you worried about the entry test to get admission in China Universities than there is a good news, China Universities don't conduct any kind of entry test for the international students, that's why its a great opportunity for Pakistani students who have tried to pass entry test but unfortunately did not got the admission in Pakistan. Even then no entry test is required for scholarship in China. Flyup Consultants offers hundred of scholarships for Pakistani students every year. China Scholarships for Bachelors, Masters and Ph.D. 2018? If you are searching for Scholarships in China top-ranked universities then you are at the right place. We offer hundreds of thousands of scholarships for Pakistani students from bachelor to Ph.D. degree programs in every field. We will give you complete consultancy services for China Scholarships which includes Free Tuition Fee for Bachelor and free tuition and hostel for Masters and Ph.D. degree programs, If you work hard and focus on your studies and get good marks in your program then china universities will also give you stipend. Engineers are considered the backbone of the country development, In every Field Engineers, play an important Role, So if you decided to become an engineer then China is the Best Destination to study Engineering, because China strategy is very different from other countries China mainly focus on Practical Education rather than the theoretical education system, China Engineering Degrees are worldwide recognized. Flyup Consultants offer also offer so many scholarships for Engineering Programs in China top-ranked engineering universities, China universities are full of international students it will be a great chance to meet people from all over the globe. So if you decided to become an engineer in your life, then China is the No1 option, China offers so many scholarships for engineering programs like Electrical Engineering, Mechanical Engineering, Civil Engineering, Software engineering etc. We are here to provide you scholarships in all engineering programs. We have a great experience to get scholarships in China for Business program like BBA MBA, Internation Trade & Economy, Accounting, Marketing, and Managment etc. China is considered the No 1 Country regarding business point of view, China is doing the business in the whole world, mostly everything see that is made in China, so if you also want to become a Business Man then International Trade & Economy is the best program for you, in this program you will learn how to do import-export business and how to build international brands. if you want to study Business programs in China on scholarship at any level like Bachelor Master orPh.D.d then you are at the right place. We also provide China scholarship for Pakistani students 2017 in all IT related fields like Software engineering, Computer Science and Technology, Computer Application Technology, Information and Communication Engineering, Information Technology and many more in Bachelors, Masters and Ph.D. level. You can also get the latest Chinese scholarships for Pakistani students 2018 officially launched by FlyUp Consultants. China has become the one of the best and favorite place to study abroad due to its great level and career building education. Due to the great increase in international students in past decades, China is offering different scholarships programs to worldwide students to continue higher education in worlds most populous place on the planet. It’s a great opportunity for international students to continue their higher education on different scholarships programs and also explore the great and old civilization and culture of China. There are two types of scholarship in China. In partial scholarship, the student may grant tuition fee or hostel fee and stipend may or may not provided to the student. In fully-funded scholarships, the student is granted by both tuition and hostel along with a monthly stipend. Note: In China the stipend is given for only 10 months a year. Following are the main scholarships programs offered by China for international students. Chinese government scholarships are basically provided by the Chinese Scholarship Council which is the non-profitable organization of Ministry of Education of China. The Chinese government has set up a variety of scholarships to support worldwide students, instructors and researchers to study and continue their higher education and research in Chinese Universities. They must meet the language requirements of the advanced education establishments. Scholarships provided by the Chinese government are usually full-funded, so it’s a great opportunity for international students to study in world’s strong economy without any cost and with great international exposure. These kinds of grants are allowed by local/provincial governments, including the government of the four Chinese urban communities considered “direct-controlled districts” (Beijing, Tianjin, Chongqing, and Shanghai), as they work as provinces in themselves. This type of scholarships supports Ph.D., Masters, Undergraduates and Chinese language courses, students. Note: Not all universities are allowed to provide Provincial Government scholarships. This program is divided into three types. The fundamental element of these grants is that the application is done specifically and only by means of the destination University. The time period of funding will also vary depending on the universities and kind of programs like Bachelors, Masters and Ph.D. degree programs have a duration of 2 to 4 years and other language courses in the vicinity of 1 and 2 years. Every year, you should apply to reestablish your grant, which will be given to you on student prove that he/she is an extraordinary student. With a specific end goal to draw in the best global students, researchers, and teachers, many established Chinese universities and colleges have built up their own grand plans. In this program, some universities offer Partial Scholarships and some offer Fully-Funded scholarships. It depends on the policy of the university you are going to apply. In this program, students can apply directly to the university offering scholarship in China.